Summertime is usually busy-time for forklift drivers. Increased orders are the norm, overtime hours usually peak in the summer months, and the unique demand & challenges of outdoor forklift operations (for some workers) demand attention to detail and safety-minded practices to avoid accidents. As a forklift operator, your employer is responsible for making sure you are kept safe and not subjected to health-threatening situations. But there are a few things you can do yourself to protect yourself against the harsh sun and hot weather of the summer. Why is Heat Dangerous to Workers in the Summer? The body maintains its stable internal temperature through sweating and circulating more blood to the skin. When someone is in a very hot environment, their body isn’t able to maintain its normal temperature as well, and cooling the body become harder. When the blood brought to the skin cannot lose its heat, perspiration becomes the main way for the body to release the excess heat. However, sweating is only effective if the humidity in the air is low enough to allow the sweat to evaporate, and whether or not the fluids and salts in the body that are lost via sweating are replaced with proper hydration and nutrition. When the body cannot expel the excess heat, the body’s internal temperature rises along with the heart rate. This can lead to heat stroke, heat rash, illness, fainting, loss of concentration, and even death. If you’ll be working outside this summer on a forklift, it’s important for you to prepare for the heat and consciously take the steps needed to make sure you are hydrated, nourished, and kept cool. Who is Most at Risk for Heat Hazards? Workers who spend time outdoors in the summer, in direct sunlight, without much shade, and while wearing non-breathable clothing and hats are some of most vulnerable to heat hazards. 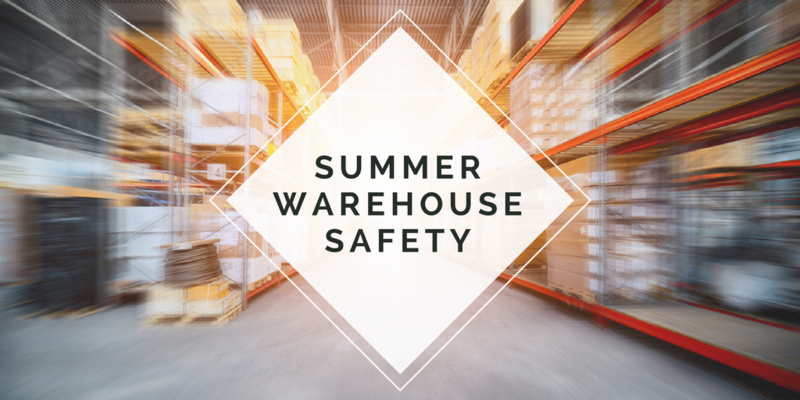 Even if you won’t be working much outdoors, warehouses and other indoor spaces that aren’t well-ventilated or lack air conditioning can get hot and humid and contribute to heat-related illness. The hazard increases if you’ll be working around radiant heat sources or handling hot objects. Stash a bottle of water in your forklift. With rising temperatures, the chance for cramping and / or dehydration increases. In order to operate your lift well, you have to be physically prepared. Staying hydrated is half the battle during the dog days of summer. Don’t skip your maintenance schedule. With sweltering conditions, your forklift needs some extra attention, too. Overheating is a common problem, so make sure your maintenance schedule is followed. Nothing ruins a shift faster than a broken-down forklift. It may seem counterproductive to take more breaks, but, as a forklift operator, you can’t do much good work if you’re dehydrated, overheated, and have lost your focus on the tasks at hand. Throughout the work day, take more frequent breaks to rest in the shade, drink water, and enjoy a small snack to keep your fluid levels up and prevent an empty stomach from further depleting your internal reserves. For outdoor workers, this is vital to summer-long safety. Spend 8 or 10 hours outside under the sun, and you’ll eventually feel the impact. If you work in a shipyard, dock or other outdoor setting, keep yourself protected with a hat, sunscreen or additional roof covering. Build a tolerance to working in the heat. As the one responsible for keeping workers safe and preventing accidents and illness, employers should allow new and returning workers to build a tolerance to the heat and gradually increase workloads as they become acclimated. Monitor signs of heat-related illness. The best way to prevent heat-related illness and accidents from happening on a worksite is to closely monitor the signs and symptoms of the beginnings of heat-related discomfort. Review seasonal safety policies and procedures. The onset of summer is the perfect time to go over any seasonal-specific safety concerns. You should do this 4 times per year, and the summer is no different. Review and implement prevention steps in forklift training. Make sure your forklift drivers are up-to-date with the latest OSHA forklift safety requirements and receive ongoing forklift training to prevent illness and accidents. At CertifyMe.net, we specialize in forklift safety. Our courses can be taken at your convenience, so there’s never any schedule conflict. Safety is simply too important to ignore – contact CM today and we’ll put your company’s safety program on the right track. Our OSHA forklift safety representatives are available at (888) 699-4800, and our contact page has additional information about our complete line of forklift training classes.